From New Hampshire Public Radio. 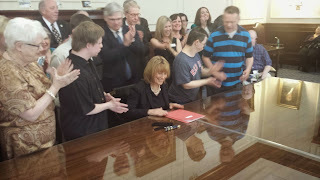 In the picture, Governor Maggie Hassan, just after signing Senate Bill 47 into law, May 7, 2015. Governor Maggie Hassan has signed into law a measure banning employers, in most cases, from paying workers with disabilities at a rate lower than the minimum wage. Decades ago sub-minimum wages were considered a way to help individuals with disabilities find work. But advocates say those wages have been used to exploit workers instead. The governor says New Hampshire has been getting calls from other states about the law. While no New Hampshire employers had been paying a sub-minimum wage, disabilities rights groups have estimated more than 400,000 workers with disabilities are paid such wages nationwide. The law includes an exception for some training programs and for family-owned businesses.